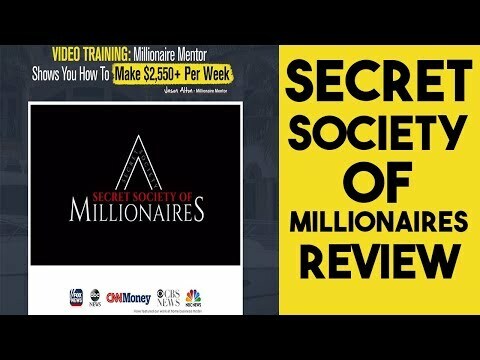 Secret Society of Millionaires Review - SCAM or Legitimate Opportunity? Today I'm going to be taking a look at the Secret Society of Millionaires website. They have some very bold claims of people making up to $2,550 per week, so I want to find out if these claims are true, or if they are fictional like most of the other scams out there. Below is my honest Secret Society of Millionaires Review, detailing all of my thoughts after investigating their website. I came across the Secret Society of Millionaires website very recently after receiving an email promoting it. At first glance, I was quite impressed by the look of their website. As far as these websites usually look, this is definitely one of the more attractive ones I've seen. If I was just going by looks (which of course I am not) I would probably think this is one of the more trustworthy websites. The first thing I immediately noticed was their very bold claims of people using the program earning $2,550+ a week. However, all of these websites have these bold claims. And with most of them being complete scams, it makes it very difficult to know who to trust. If you've seen my other reviews or my videos on YouTube, you will have seen that I have uncovered many different scams, and all of them have had similar claims such as this one. So, seeing bold claims like this always makes me immediately sceptical and want to dig deeper in order to find out for myself, and for you guys, if it's a scam or not. The first line of the website claims that they have paid out over $76million. This amount is huge, so it makes me wonder, what the heck are they actually selling here? If you spend the time to watch the video, it's actually very well made and makes it sound amazing. It promises you won't need your own products to sell, you won't have to deal with any customer services and you'll only have to work for around 30 minutes or less per day. They promise you an easy to use system that will help you achieve your dream life of paying off your debts, living in a big, fancy house, going on your dream vacations and not having to work for anyone but yourself. They claim that this is all done on autopilot using their system. Anything that says it's ‘autopilot' or ‘automatic' always worries me. In my experience, these are usually the websites not to be trusted. What Exactly is Secret Society of Millionaires? After digging deeper into their website, I was able to find out what product they are really selling. It turns out, they are promoting another very well known business opportunity which you may have heard of already called “MOBE” (My Own Business Education). MOBE is probably the biggest and most well known business opportunity on the market right now. Therefore, it does have many affiliates making websites just like the Secret Society of Millionaires, as they are trying to get their sales by disguising it under other names, trying to make it sound more appealing and secretive, to make people more enticed into buying it. If you signed up to Secret Society of Millionaires, or MOBE, you would have to spend THOUSANDS of dollars before you can even start earning a penny. It's a very, very high ticket business opportunity. With businesses like MOBE, If you want to earn $1,000, you would first need to spend around 2.5 times that to purchase the product for yourself, before you can get the licensing to start promoting and selling it. It's basically like a ‘Pay to Play' kind of system. You also won't be getting any mentor to help you. You will get a salesperson who will be constantly up-selling you more and more, promising that if you spend more, you can earn more. This is true, however, you will probably be spending 5 figures. Their cheapest product is around $2,500 and their most expensive product is around $30,000. If you're anything like me when I first started, you don't have that kind of money to spend. The picture below shows the different levels of programs you can get with MOBE. As you can see in the picture, without purchasing the minimum “Silver” program, you won't be able to earn a single penny. The standard package of $49 that Secret Society of Millionaires is just the standard package which will get you nothing but a phone call with a sales person. The regular price isn't $597, that is just a tactic they have used to try and make it seem like you're getting a great deal and should buy it right now. But as I said, even if you purchase this for $49, you won't start making any money at all until you've purchased their Silver Program for $2,500. Is Secret Society of Millionaires a Scam? So, the question you were all probably initially wondering, and the reason you're probably even reading this review is “Is it a scam?”. In short, I would say, no. No, Secret Society of Millionaires is not really a scam. However, this doesn't say I would recommend buying this opportunity. As I've said previously, this is just an affiliate marketer promoting MOBE. I'm not saying MOBE isn't a good business opportunity, but it is VERY high ticket. You would have to spend thousands of dollars before you can even attempt to start selling the product yourself. That also isn't promising you'll actually get sales. You will have to do all of that work yourself by promoting it to get the sales. You will be put through MOBE's 21 step training to teach you how to make sales, but it for sure isn't like the video promises, everything is on autopilot and you have to do little to no work at all. That is completely false. I will keep this short and just say, I do NOT recommend buying into Secret Society of Millionaires or MOBE. I do not see the point in having to first spend thousand of dollars to license a product in order to start earning income from it. I'm also 100% sure you will not earn the type of money they are claiming on their website. So that's basically it for my Secret Society of Millionaires Review. Thanks for reading. Watch my Secret Society of Millionaires review video below and don't forget to subscribe to the YouTube channel.